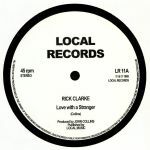 Review: Rick Clarke's smooth 1985 cut "Love With a Stranger" has long been considered one of the unheralded British soul gems of the mid 1980s. Unlike many similar records from that period, it's aged impeccably well, sounding every bit as magical now as it did when it first appeared in stores way back in 1995. That's testament to John Collins' unheralded production, of course - all unfussy slo-mo drum machine beats, ear-catching synth bass and chiming '80s soul melodies - but also the endearing quality of Clarke's superb, reggae influenced lead vocal. Like the original 12", this timely reissue pairs the brilliant original version with the slightly more spaced-out and instrumental Dub.